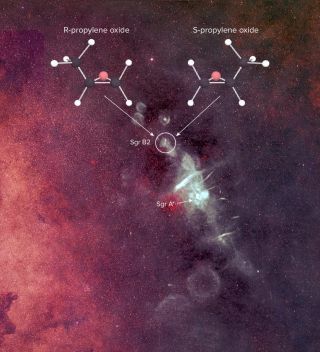 Propylene oxide has previously been discovered in the star-forming region Sagittarius B2, near the Galactic Center. The building blocks of life might have had a cosmic origin before hitching a ride to the early Earth on meteorites, according to a new study that connects the left-handed nature of those building blocks on Earth with star-forming regions. Scientists continue to investigate where the building blocks of life came from and how common they might be throughout the Universe. For every building block we identify, from carbon and phosphorus to proteins and nucleic acids, we also have to ask, when did it get here? How? And from where? A recent study published in Earth and Planetary Science Letters may have some of the answers. Sandra Pizzarello of the School of Molecular Sciences at Arizona State University, and Christopher Yarnes of the University of California-Davis' Department of Planetary Sciences, studied extracts from the Murchison meteorite, which landed in Australia in 1969 and remains one of the most studied meteorites given its 200-pound (90 kilogram) heft and carbon-rich composition. Inside the extracts they found evidence for a chiral molecule also found in distant star-forming regions. Chirality refers to the arrangement of atoms in a molecule. Think of the mirror image of a symmetrical object, such as a chair or a stapler. Its mirror image can be perfectly superimposed onto the original. However, the mirror image of a chiral object, such as your hand, cannot be superimposed onto the original. Homochirality, or one-handedness, plays a key role in cellular chemical reactions, and all living organisms (that we know of) contain the 'left-handed' molecules. Scientists aren't sure why this is, but some believe the answer may have something to do with the molecules' cosmic origin. In 2016, researchers found propylene oxide, a chiral molecule, in Sagittarius B2, which is a massive molecular gas cloud roughly 25,000 light years from Earth, near the center of our Milky Way Galaxy. The findings suggest that the chiral molecules necessary for life may have come from space, particularly from star-forming regions. Here we see a left-handed and a right-handed amino acid. The chirality of all amino acids on Earth is left-handed. Pizzarello and Yarnes extracted powder from the Murchison meteorite with ethanol and then tested it for propylene oxide, the chiral molecule previously found in Sagittarius B2. They found two propylene oxide derivatives in the extracts, and hydrolysis (breaking down the chemicals with water) caused those derivatives to produce propylene glycol, further confirming the presence of propylene oxide. One surprising result was the formation of polymeric compounds in a sample that had been refrigerated for four weeks before undergoing hydrolysis — another indication of propylene glycol. Such compounds could, the researchers suggest, "form from meteoritic propylene oxide both in the parent asteroids… and on the early Earth." This suggests that the molecule has an ability to withstand the harsh environment of space and long cosmic journeys. One of the researchers' conclusions is that meteorites contain a "yet unknown compositional complexity." Scientists don't know what other molecular secrets meteorites hold, or how those could change our understanding of life's origin. What we do know is that meteorites seem to have the ingredients for abiotic synthesis, or the creation of compounds from non-living molecules. "Meteorites contain everything we searched for in a complete variety of molecular species," Pizzarello tells Astrobiology Magazine. In other words, chemical processes, rather than biological ones, may have generated the first living cells, all of which are homochiral. The cause of life's chiral bias is unclear. Astrobiology professor at the University of Edinburgh's School of Physics and Astronomy, Charles Cockell, believes "it makes sense that life would use one chiral form to simplify biochemical recognition," but the source of that disposition involves the as yet unanswered question of whether chemical processes predated biological ones, or as Cockell puts it, whether chirality originated from a "prebiotic excess of one form that predisposes life to amplify the chirality it now shows." A sample of the Murchison meteorite, which fell in Australia in 1969 and which contains various organic molecules that may hint at the origin of life. Although meteorites carry the molecules necessary for life, Pizzarello points out that we still don't know whether they're responsible for life on Earth or whether they're the only cosmic vehicle that brought chiral molecules here. Definitive answers will be difficult to obtain, but Cockell believes scientists can chip away at the puzzle by studying how molecules crucial to life form in space and what processes select for chirality. "What other prebiotic secrets are locked up in unknown compounds [in space]?" he wonders. Regardless of the answer, the study suggests "very deep roots for the chemical evolution that preceded life." The idea that chirality, a predisposition inherent in all life as we know it, either began with or arose from the birth of the Milky Way Galaxy some 13.6 billion years ago delivers a dose of cosmic perspective. As Carl Sagan said, "we're made of star stuff." The findings also hint at the even bigger question of determinism, which is whether physical or chemical laws determine the chirality of life, or whether it's down to chance. "In many ways, at least for the origin of life, meteorites offer the key to separating those two things," says Cockell. The work was supported by NASA Astrobiology through the Exobiology & Evolutionary Biology 'Earths in Other Solar Systems' program.